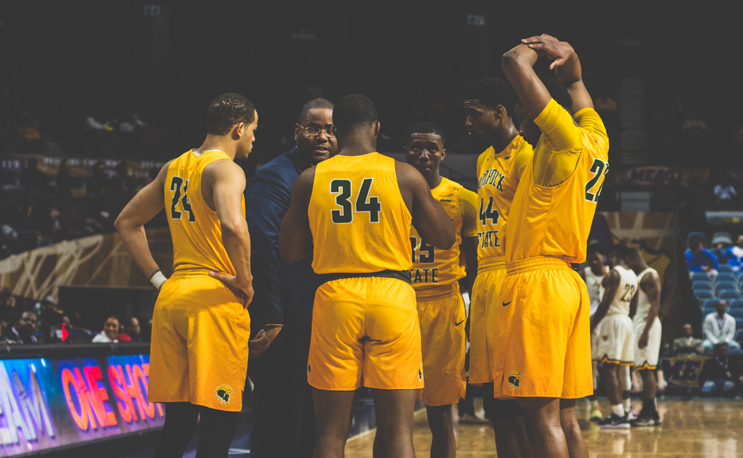 NORFOLK, Va. – A school record 18 3-pointers highlighted a hot-shooting night for the Norfolk State men’s basketball team on Saturday evening at Joseph Echols Hall. The Spartans stayed perfect in the MEAC with an 88-60 win over Maryland-Eastern Shore. NSU topped the previous school record of 14 3-pointers, set four different times in recent years. The Spartans made 18-of-27 for the night, a Division I school record 66.7 percent clip. It was part of an overall 55 percent shooting performance. They moved to 7-0 in the league and 12-10 overall. NSU scored its most points in regulation this year against a D-I team despite having just three players in double figures. And all three played a big role in NSU’s hot night from beyond the arc. Junior Nic Thomas scored a career-high 26 points, hitting 7-of-11 from deep and 8-of-13 overall. He finished one 3-pointer short of tying the school record of eight held by two different players. Sophomore Mastadi Pitt scored 18 points on 5-of-7 shooting, 4-of-5 from 3-point range, with four rebounds and three assists. Senior Derrik Jamerson Jr. made all four of his 3-pointers as part of a 16-point evening with five boards. NSU finished with 19 assists on its 28 buckets and outscored the Hawks 15-4 in fastbreak points. Maryland Eastern Shore fell to 3-19 overall and 1-6 in the league. The Spartans were knocking down 3-pointers from the beginning, which led to an 18-6 advantage seven minutes into the contest. They continued to fall, as long-range shots by Jamerson, Thomas and finally junior Steven Whitley made it 32-15 with 8:13 to go in the first half. Freshman C.J. Kelly and Pitt each had treys, and Sophomore Kyonze Chavis’ 3-point play with four and a half minutes left made it a 20-point ballgame. The Spartans made 11 3-pointers in the half and went into the locker room up 48-27. Pitt, Thomas and Jamerson had all reached double figures in scoring by the intermission. NSU stretched the lead to 27 at the start of the second half. The Hawks did not go quietly, as they used a 21-7 run to cut the Spartan lead to 13, 61-48, with 12:27 on the clock. Whitley ended the run with a trey, and Jamerson and Pitt each had long-range shots to break the school record with nine minutes to go in the game. The Spartans pushed their advantage back up to 28 a little later in the game thanks to a 12-2 run, and the game later ended at that same margin. For the Hawks, Ryan Andino shot 7-of-13 to lead the way with 19 points, and Canaan Bartley tallied 15 points on 6-of-12 shooting with six rebounds. MDES made 44 percent for the game (23-of-52) and held the advantage in points in the paint at 28-18.